Blood & Roses: Vin’s visions are becoming more specific. The Heart Warrior finds he must revisit the unusual circumstances of the beginning, in order to aid the MCAT Seven in their newest quest. Tannertexaslady: Any mistakes are mine. The original characters in the MCAT series belong to the authors who created them.Wendy, you have been there from the start, thanks for agreeing to finish the journey. Series 3 will conclude the MCAT adventure. While it has already been one hell of a ride for me and muse, series 3 holds a special place for me. This set of 7 stories will be the ultimate ride. Muse is in complete control and I hope y’all like where she takes us. Wendymypooh: I am honored to be once again writing with Sherry. MCAT has, and will always, hold a very special place in my heart. Acknowledgments: Mary Ann thanks for signing on as collage maker for series 3. 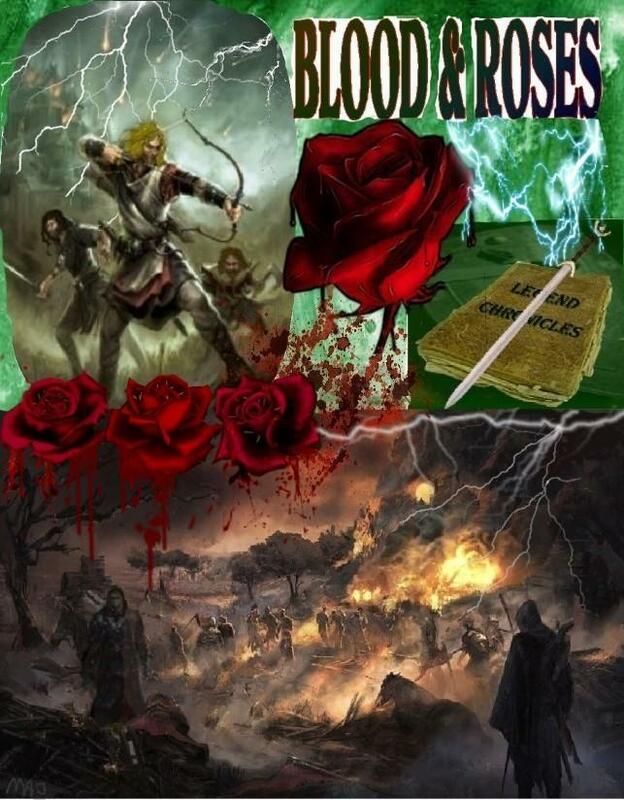 The Blood and Roses collage is awesome! Sue, your poems are awesome, a great addition for the series. Muse Ladies...thank you. Nancy, the home you give the boys at Blackraptor is greatly appreciated. For Miranda and Karissa, Sherry’s granddaughter’s, we thank you for your constructive comments. Disclaimer: This story is a work of fiction for entertainment purposes, based on the characters from ‘The Magnificent Seven.’ I don’t own 'em. No infringement of any copyrights intended. Any references to locations or people are for story use, and do not intend to depict any real place or person. The sun glowed warmly against the cerulean sky, casting its golden rays down upon a handsome young couple strolling hand in hand through a grassy meadow strewn with delicate Blood Roses. They came to a stop beside a babbling brook, and lingered to catch their breath, and survey their beautiful surroundings. A wave of mahogany blossoms stretched out across the hilly countryside for as far as the eye could see. Dotted sporadically throughout were green strands of highland grass, stalks of lavender Heather, pale Thistle, and white Mountain Avens. But it was the deep red of the blood roses that was truly the most glorious sight of all, and was the reason for the couple’s journey to this area of the highlands.
" Truly a bonnie sight," sighed the young woman, her green eyes sparkling as she took in the wonder of nature around her. "Aye it is," her husband remarked, his nose buried in the folds of the brochure he held in his hand. "It says here that ‘tis the lone place in the highlands where ye can find the wee flowers. For many a century kin how they came to be here or why." "Such a wonderful tale‘tis," his bride remarked. " ‘Tis said that a ferocious battle was fought here an’ many lives were lost. ‘Tis believed that the life’s blood of the warriors seeped into the ground, mixin’ with seeds found in the crick an’ formed the bonnie roses." "Hmm," her husband mused as she continued, "‘Tis also believed that if ye pick one, ‘nother will replace it." Crouching, the young man plucked a mahogany blossom from its brilliant green stalk, wanting to disprove this particular tale, only to see a miraculous thing happen instead. Where he had just severed the Blood Rose from its stalk, another one had formed right before his very eyes. "Blarney! Did ye see that? "he exclaimed in astonishment. "‘Tis true, they do grow back!" Standing, he handed the Blood Rose to his wife, who lifted it momentarily to her nose to inhale its sweet scent, before lowering it so she and her husband could study its beauty. Inside the silky soft petals they saw the signature marks of white within, which resembled swords. "Glory be," She gasped, "The mark of battle brands ‘em, so they cannae ever be destroyed!" "I didna wanna believe any of the tale was true, but I donnae deny now that it does," her husband admitted. "I came only to humor ye, but this magical place has made a believer out of me. As much as I know ye donnae wanna leave, we must be on our way. We have a bit of a drive ‘til we reach the inn." She sighed, knowing he was right, but hating to go nevertheless. She glanced around again at the wondrous sight surrounding them. Then reluctantly, she slipped her hand through the curve of his arm, and allowed him to lead her across the meadow to where they had parked their vehicle. After he finished recording his latest vision, Vin laid his pen aside, leaned back in his chair, rubbed his hands down his face, and sighed deeply. This vision confused him. He already knew the story of the roses and how they came to be. Why go back to it now? Somewhere across the winds of time, he heard the now familiar voices of his ancestors chanting in his head, "Write it down." Since donning the mantle of Heart Warrior for his seven, the one thing Tanner knew with certainty…..NEVER dismiss the voices. He picked up his pen, reopened his vision journal and began to write. It was forever ago, and yet a small twinkle in time. Born in a homeland, which traversed mortal and mystical spheres, our ancestors were a spiritual people composed of poets, musicians, storytellers, seers, scribes, folk healers, warriors and priests. Our world overflowed with tales of romance, heroism, vision, and honor. I was one of seven powerful brothers, born of a seventh son of a seventh son, bound by blood, heritage, and love. Before I attempt to define at least one of the unexplained mysteries of the past, its best to describe the roles we each play in our legacy. Names are unnecessary as those change too often, but the will of fate in our lives is strong and steady. Our father instilled in us all a strong moral compass and code to follow throughout our lives, just as his father had done for him. We were taught that it was our duty to protect and defend justice, righteousness, and natural virtue, all which we equated with Light. His teachings serve us well, as it did our forefathers, when dark forces attempt to infringe itself into our world. We are seven men whose predestined roles as warriors, combined with our individual and unique inherent abilities, helps us in our endeavor to tip the precarious scale between good and evil permanently to the Light. Our eldest, guides us from a spiritual plain, a man of philosophy and contemplation, he deciphers the messages we require to progress. Next in line, our Chief, the rock we anchor to, whose commanding inner voice, keeps us focused. We follow him without question. His sense of right and wrong is infallible, and the righteous path he leads us to pursue, ensures our success. Beside him stands our third brother, Guardian of the clan, in battle and in life, his arms enfold and protect us from unmerited attacks. Our fourth brother is skilled in the art of healing. Sibling number five directs us with his ability to see beyond the obvious and keep the lessons from our past viable. Part is mental; the rest, an inert awareness he has enables him to 'ferret out' things the rest of us don’t see. Our youngest finds the best way for us to adapt to new ideas, and gives voice to our message. And me? Born the sixth of seven brothers, I am a Heart Warrior. My prophetic visions and gift of mental communications allow me to sense all we each need to complete our transitions, and embrace our destinies. A calling of silent protection, carried out with strength and integrity, for the hearts and souls of those we hold dear, while ensuring a strengthening of the bond that protects our legacy, as well as our souls. Belief in our code and perspective… that's what it's all about…always has been... and always will be. On the other hand there is destruction and malevolence. The army of darkness has tried and failed to weaken us over and over again. The personal nature of evil’s agenda against us is rooted in flawed beliefs. They, in particular one master of manipulation, refuse to acknowledge that without light, there is no darkness. Without good there is no bad. Without justice there is no injustice. Destroy Fate and you destroy the future. Where our spiritual leader directs us toward the light, the master manipulator, who takes many forms, leads assassins to deliver death and devastation. Using the skills of tricksters and sorcery, he misleads masses into believing that bad is good, that power and wealth are justified at any cost, and Fate is not predetermined, but is only what you make it. Evil’s ultimate goal is to destroy our legacy once and for all, absorb our power, and enjoy free reign without constraint. While we seek peace, there have been periods in our existence when forces of inequity, strong enough to demand attention, threaten the righteous, and endeavor to gain absolute control. Then, our undying bond of trust and duty, calls upon us to balance the scales of justice. Looking back to those fateful days preceding the battle at what is now called Rose Field ,we believed evil could not touch the core of our being. That standing on the right side of justice and use of our honed skills, insured our success against any threat. We believed our bloodline would carry forward and our power as brothers would stand witness to the coming centuries and always be. Good and evil had managed to co-exist for a long period of relative calm. One side or the other occasionally made minor efforts to tilt the scales of justice, and small skirmishes occurred, a bit of push and shove, but nothing earth-shattering. However, the unseen turbulence simmering below the surface, was almost to a boiling point. Soon the gates of hell would open wide, forcing us to take a long and perilous journey, fraught with constant challenges, which threaten the delicate balance we are destined to protect. That was about to change. Evil struck violently without warning, intent on destroying the scales of justice once and for all. Returning after our annual pilgrimage to the circle of stones, we were met with a horrific sight. The lively and active village we had left mere days before, now lay in total desolation before us. Burning pyres of ashes rose up sporadically amid the village ruins, the stink of their smoke filled our nostrils with the sickening realization that their fires were fueled with the flesh of our fallen kinsmen. Amid the broken pottery, soiled hides, and sundry other items strewn throughout the land lay the too still bodies of our beloved women, who had endured ravaged degradation, along with the battered forms of our cherished children. Grief threatened to overwhelm us, but we could not give in to it. Our Chief called us to action, rallying us to battle. As one we moved through the decimated village, searching out the marauders who had committed such evil against us, swearing vengeance for the devastation and destruction they had wrought. We believed that we would be victorious over this foe, as we and our ancestors had time after time. Assassins waited in the murky shadows, eager to exact their murderous intent upon us in hopes of successfully terminating our bloodlines, and shifting our power from the Light, into darkness. We met their sudden assault head on, firing flaming arrows at their charging forms, immediately eliminating their front row, before we swung down from our racing mounts, and met the rest man to fiend. The metallic clang of broadswords violently meeting each other, combined with our anguished war cries, filled the air around us as we waged a fierce battle with our enemies. Soon the coppery scent of blood attacked our noses, covered our clothing, and flowed freely into the muddy soil under our feet. As we valiantly fought against our oppressors, an ominous mist crept slowly over the battlefield, obscuring our enemies from our sight. Time ceased to exist as Mistress Fate and Master Darkness intervened, waging an elemental war above us. Lighting flashed, thunder rumbled, fireballs hurled across the vast and malevolent sky. The field beneath us shook violently, throwing us off our feet, our bodies striking the ground with such force, that inky blackness swam up to meet us. Though both sides fought to win over the other to their perspective sides, ultimately neither would claim unconditional victory in the end. Master Darkness used the power of sorcery to destroy our familial bonds in this earthly sphere, believing it could absorb our power and end our quest for rectitude forever. Mistress Fate, however, favored our honorable pursuits, and knowing our power was drawn from more than blood ties, cast us into the winds of time, scattering seeds, which immediately formed a wave of Blood Roses across the battlefield to mark our transition..
Tanner stopped writing. Reliving that battle left him fatigued, his shoulders ached, and his head pounded. He waited, and after receiving no answer,Vin decided it was time to head back to bed. As he replaced the Vision Journal on the shelf, his fingers brushed across his copy of Legends of the Quest. He knew that when the time was right, he would understand, and with a nod to his unseen ancestors, he exited his office, wearily ascended the stairs, and entered his and Kelli’s bedroom. He glanced down at her and decided that he would wait until after their trip to share his latest vision with her. Vin was more than ready for sleep to claim him, after all he had participated in one hell of a battle tonight.